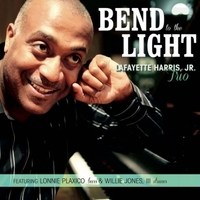 Lafayette Harris’ new CD “Bend to the Light” makes you feel at home with the very first, captivating, musical phrase of his opening title song. He sets the tone with his light, yet strong and resonant sound, then invites you to join him on a fantastic jazz journey through a selection of a dozen pieces: modern and smooth, nostalgic yet hip, well-loved standards, and internationally inspired originals. “Old Devil Moon” and “Tenderly“, jazz standards shaped by Layfayette into beautiful jazz voyages that evoke memories of the lyrics yet take you somewhere new. Each piece on “Bend to the Light” is a beautiful jazz voyage – I am glad I got my ticket to ride along. Lafayette’s website is here: Lafayette Harris, Jr.